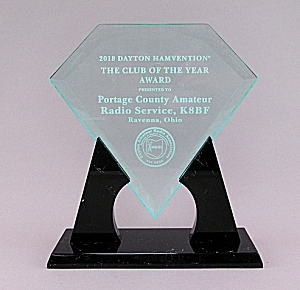 “The Dayton Hamvention® Club of the Year honors go to the Portage County (Ohio) Amateur Radio Service. This very busy club says it has over 40 hours of activities each month, including public service, student outreach, periodic “Build Days” for working on projects together and monthly “Get On The Air” days when the club station is open for members and guests to learn about HF and different modes of operation. our club what it is today. Along with future members our club will be even better in years to come. Welcome to the latest members of PCARS! If you meet these people on the street, in a meeting, or on the air, be sure to say Hi and introduce yourself. Let's make our new members feel welcome! Just a reminder that tomorrow evening at 7PM, we will be holding our DX/Contesting Special Interest Group Meeting and we will be reviewing the rules for the Florida QSO Party. Many of you know that this coming weekend, we will be putting K8BF on the air once again in this contest. The contest is made up of two ten hour operating periods, with a ten hour break. This is for our slightly more mature members whose derriere needs a rest at times. The rules are somewhat different this year so those of you who will be participating should be at the meeting tomorrow evening. Hope to see many of you there. I am cancelling “Net Night at the Clubsite” for this week. The net WILL take place, as normal, with John – KB8UHN – as net control operator. My apologies for this, I have a family obligation that could not be changed. However – May’s net night at the clubsite will be Thursday May 23rd, the week after Hamvention. There will be lots of good information to share. I look forward to seeing you all there and then! Soon after the “FT8 Roundup” held on December 1-2, 2018, we started serious work on a faster, more contest-friendly digital mode that can compete with RTTY-contesting QSO rates while preserving many of the benefits of FT8. The result is FT4 — a new digital mode specifically designed for radio contesting. Over the past month a small group of volunteers have been conducting on-the-air tests of FT4. The early tests were very successful and helped us to make a number of important design decisions. We believe FT4 has considerable promise for its intended purpose. April is rapidly coming to an end. April showers bring May Flowers and HAMVENTION®, too! Along with that, the May PCARS newsletter – The RADIOGRAM will be out shortly. The last Friday of the month is April 26th – just a few short days away. Time to get your inputs sent in to be part of the greatest newsletter around. Please get your inputs sent in (with large format & in-focus pictures) no later than Friday the 26th at 8 pm. I’ll be looking at my e-mail box for something from YOU! Send your inputs to KB8UUZ@gmail.com. In addition to the amateur radio equipment which attracts all the ham radio operators, there are also vendors selling a variety of other electronic equipment including computers and accessories, security devices networking supplies, tools and many other items of interest to the general public. Those visiting the flea market area will be surprised at what’s available, often at a small fraction of its original cost. The chairman said that Sunday is Hamvention’s lightest traffic day, making it convenient for anyone who just wants check out what’s there. Many vendors have final day specials on a variety of items. The many food trucks offer a wide selection of menus, providing residents with a chance to make Hamvention 2019 a family outing. Hamvention hours are 9 a.m. to 1 p.m. on Sunday and 9 a.m. to 5 p.m. on Friday and Saturday. While some parking will be available at the fairgrounds, much of it is weather dependent. Visitors are urged to use one of the remote lots with free shuttles. They are located at Hobson Freedom Park, 2910 Trebein Road, Fairborn, OH 45325; Xenia High School, 303 Kinsey Road, Xenia, 45383; Warner Middle School’ 600 Buckskin Trail, Xenia, OH, 45385 and Xenia Towne Square, 84 Xenia Towne Square, Xenia, OH, 45385. Buses run from 7 a.m. to 6 p.m. Friday and Saturday and 7 a.m. to 4:30 p.m. Sunday. Just a reminder that we will be participating in the Florida QSO Party on the weekend of April 27-28. We will need ops, so let me know if you plan to attend and operate. We will have one more Dx/Contest meeting prior to the contest, on Tuesday, April 23. That’s a week from today. If you are going to be participating in the FL-QSOP, then please try to make the meeting. Let’s have a good turnout for both events. If you are an ICOM fan and you are going to Hamvention, here is an interesting contest you may want to enter. The Antenna SIG will meet at 7:30 PM in the PCARS club site radio room, this Tuesday 4/16/19 . Please note that our regular meeting time of 7 PM has been pushed back to 7:30 to accommodate Field Day planning meetings which will be held from 6:30 to 7:30, January to June. ALL PCRS Members are invited to attend FD meetings as well as well as the Antenna SIG. All PCARS members and guests are welcome to attend the Antenna SIG (the Field Day meeting is only open to PCARS members). We will be discussing all antenna related topics including selection, design, construction, trouble shooting and safety for all Amateur Radio bands. Our special topic tonight will be to select three (3) or four (4) simple wire antennas that can be home built by most hams, fit on most city lots and work on multiple, if not all, HF bands. We will develop detailed designs and specifications, then build and test each design. These will be suitable for new inexperienced hams or the most seasoned ham operating QRP to QRO. And all built for minimum cost! We will see how many weeks it takes to finish this project! The April Monthly FD Planning meeting will be held on Tuesday 4/16/19 at 6:30 to 7:30 pm in the radio room at the PCARS Club site. All FD Station Captains and FD Staff should attend. Our monthly meetings are also open to all PCARS members who wish to participate. These meetings will end at 7:30 sharp to accommodate the following Antenna SIG Meeting held immediately after our meeting. The main topics of discussion for this Tuesday evening will be to finalize planning for Antenna Day, which is scheduled for May 11, 2019 and continued planning for Field Day. AGAIN, Our stated goal this year is to be #1 in the nation in our 4A operating Class. We are making a number or tweaks and upgrades to our 2018 operating effort that we expect could move us up from #4 to #1. But it all comes down to the work that our members put in to make this happen. This is a Team effort……Come Join the Field Day Team, even if you can only make a small contribution to the effort, it all adds up and can help us reach our goal.